Join us for a special story hour with Erin Dionne! 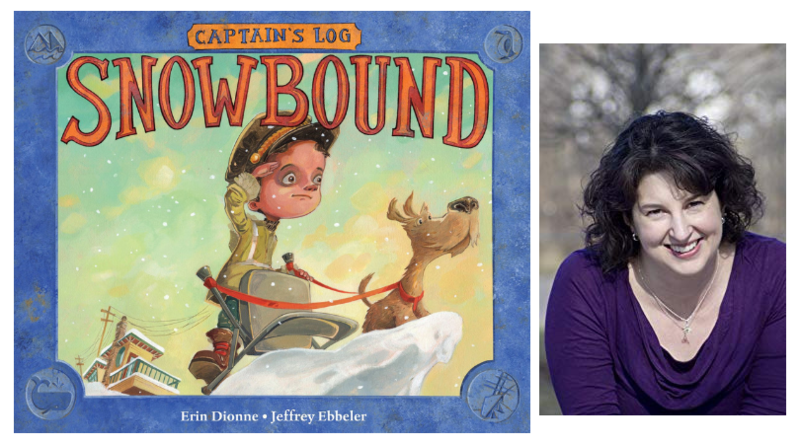 She'll be reading her new picture book, Captain's Log: Snowbound. When his Ernest Shackleton report is ironically quashed because of a snowstorm, a school cancellation-celebrating elementary schooler chronicles his adventures at home with hilarious log entries and read-aloud-friendly results. The Captain's (our young protagonist) belongings start to go missing while homebound due to weather, and humorous attacks and pell-mell mutiny follow. After a series of snow day events, the crew (the Captain's parents), the first mate (his trusty dog), and the scallywag (also known as the younger sibling) are freed from their snowbound home, and the Captain returns to school. Kids will laugh at the Captain's battle with his siblings, and parents will relate to the antics that ensue when the weather prevents students from heading to class and upsets daily routines and schedules. Erin Dionne is the author of several middle-grade novels, including Ollie and the Science of Treasure Hunting; Moxie and the Art of Rule Breaking, an Edgar Award nominee; and Notes from an Accidental Band Geek. Her books have been featured in Scholastic book fairs, on state lists, and in major magazines. Erin is an associate professor of liberal arts at Montserrat College of Art in Beverly, Massachusetts. This is her first picture book. A perfect choice for kids (and parents!) trapped inside on a snow day.